As spring-like as you'll get in a small footprint. Great spring-like tones in a practical format. All-analogue dry signal path. 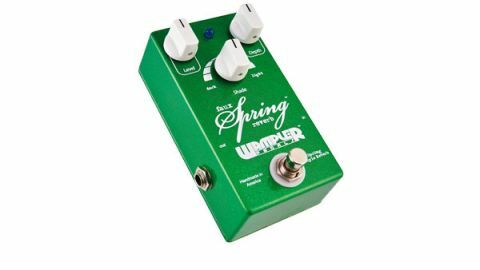 Using a real spring is not always practical, so Wampler's Faux Spring reverb pedal is a digital stompbox designed to deliver a faithful recreation of the sound. "This may be as close as you'll come to spring reverb in a practical format"
It features an all-analogue dry signal path, so your basic tone doesn't get messed with, and cloaks your sound with authentic spring-like ambience. The three knobs do pretty much the same as those on the recently reviewed Fender '63 Tube Reverb (an authentic outboard spring reverb): shade is tone, depth is dwell, and the sound comes pretty close, too, albeit lacking some of the randomness of a real spring. If it has to be spring reverb and the real thing isn't doable, this may be as close as you'll come in a practical format.